The latest incident at Mooknor, Jalyiah village, about 5 km from the district headquarters, came to light, after a relative of one of the miners Philip Bareh filed a police report saying his 26-year-old nephew Elad Bareh had been missing since Friday. Meghalaya miners were trapped in a coal-mine in East Jaintia Hills since last year. Photo Credit: ANI. 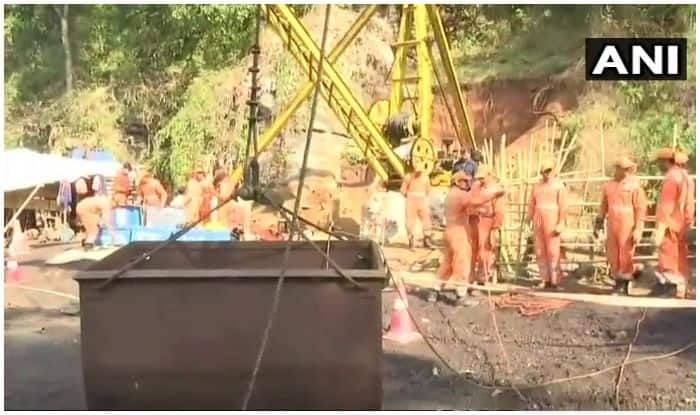 New Delhi: Two coal miners were killed after an illegal coal mine collapsed in Meghalaya’s East Jaintia Hills on Sunday. The mishap comes amid a tottering rescue operation for the 15 miners trapped inside a flooded coal pit in the same district. Meanwhile, rescue operations for the 15 miners trapped in a flooded illegal coal mine at Ksan village hit a roadblock Sunday as the two high-powered pumps engaged in dewatering encountered technical glitches. The high-powered pumps of Kirloskar Brothers Ltd were recently pressed into action to dewater the main shaft, where the miners are trapped. Another submersible pump from Coal India Ltd (CIL) also faced a snag, affecting dewatering operations in the nearby abandoned mines. “Two pumps from Kirloskar Brothers and the submersible pump from Coal India encountered glitches and the dewatering process in the main shaft was affected,” R Susngi, spokesperson of the operation said. The two high-powered pumps are undergoing repair work, he stated adding that the CIL pump was replaced with a new one. The CIL is expected to put into operation at least three more pumps on Monday, Susngi added. On Friday, the National Green Tribunal (NGT) imposed a fine of Rs 100 crore on the Meghalaya government for its failure to curb illegal mining in the state. The Supreme Court also expressed dissatisfaction over the outcome of the rescue operations at Ksan coal mine. Reacting sharply to the incident, former Chief Minister Mukul Sangma has said illegal mining activities in Jaintia Hills were carried out due to the greed of the people in power.